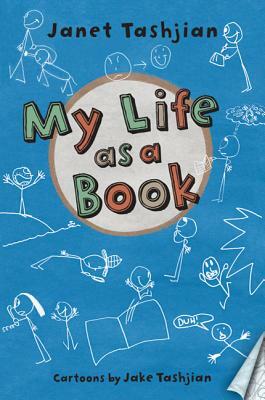 MY LIFE AS A BOOK by Janet Tashjian, Cartoons by Jake Tashjian (Christy Ottaviano Books/Henry Holt, July 2010, $16.99, for ages 7 to 12). Twelve-year-old Derek Fallon hates reading, unless it's a comic book. So he's not looking forward to his summer reading assignment to read three "real" books. His parents even sign him up for Learning Camp to help him overcome his reading problems. Blech! What a lousy summer. But the summer might just turn out to be far more eventful than Derek ever dreamed. He discovers an old newspaper story about himself as a two-year-old and vows to find out more about it. He makes some interesting new friends, including a boy with a monkey. And maybe, just maybe, he'll manage to read a book. Diary of a Wimpy Kid fans, rejoice! Here's a story you'll love. Okay, so it doesn't have as many cartoons as Wimpy Kid, but it has a meatier plot, which I'm only hinting at here because I'm trying to avoid spoilers. And it's written by the amazing Janet Tashjian, of Gospel According to Larry fame. Here, she's reaching out to a younger audience and letting her 14-year-old son do the illustrations. A fun and fast-paced summer read. WE HEAR THE DEAD by Dianne K. Salerni (Sourcebooks Fire, $9.99, pub date 5/1/10, fine for ages 12 and up). Buy it from your local indie bookstore here. In mid-nineteenth century America, mysterious knocking noises haunt Maggie and Kate Fox, two teenage girls who become famous for their apparent ability to communicate with the dead. Do the sisters have a supernatural gift -- or is it a hoax? I had the pleasure of meeting Dianne Salerni last Saturday. I'm a firm believer in supporting local authors when their books are published (and not just self-published). Her book surprised me. The title and font may call to mind a gory horror story or something paranormal (Dianne herself wanted to call it High Spirits, and in fact originally self-published it under that title, but when Sourcebooks picked it up they changed the title to be more commercial). Yet this is straight historical fiction (with a slight hint of the paranormal). 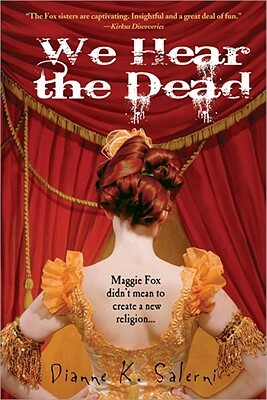 Thoroughly researched and well-crafted, We Hear the Dead is a book to get lost in and enjoy. It's long (448 pages) but reads quickly. The voice of Maggie is that of an authentic teen, conflicted about her unplanned role as a spirit medium, and doing her best to comfort the bereaved. I don't think what I'm about to reveal is a spoiler because it's mentioned early on in the novel, but just in case, SPOILER ALERT: Maggie Fox was 14 years old in 1848 when she and her 11-yr-old sister Kate started spirit rapping in their small town of Hydesville, New York, as a prank to frighten a silly relative. They made the knocking sounds by cracking their ankle and toe joints! They had no idea their childish joke would later turn into a fashionable religion, with famous followers like Harry Houdini and Sir Arthur Conan Doyle. Where Maggie and Kate treated it all as fun, their older sister Leah saw a business opportunity. By the 1850s, Spiritualism and seances were all the rage in New York society. Apparently everyone in those social circles had a dead relative they wanted to contact and the Fox sisters became well known, and well paid, for bringing forth those spirits. It's no coincidence that the publisher choose a cover that shows Maggie as a performer, about to go on stage. It was all pure entertainment. But Salerni hints that younger sister Kate may have actually had second sight and might really have known when spirits were nearby. In short, a lively, spirited, true-to-life account. "We can... fight off the weenuses and hosebags"
She's right! Don't let the internet turn into one ginormous commercial! Don't let us become a mindless consumeristic society like the one in M.T. Anderson's modern classic futuristic novel, FEED. Do you agree? Disagree? The internet is a conversation. I'm here. Let's talk. Can't help but wonder: if all those people are tweeting, is anyone reading? Grrr. Do you ever get frustrated with the internet?